Thanks for visiting the Fast Waste web site. We specialise in collecting and disposing of all types of waste within North London and Southern Herts including household rubbish, commercial waste, builders junk, old and unwanted furniture and even piano’s and other bulky items. In fact, we’ll load and dispose of just about anything and our charges are very competitive – see our price page. 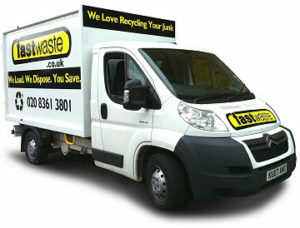 We’re a real alternative to hiring a skip or making time consuming journeys back and fourth to the local tip. We’re sure you’ll find our service quick, reliable and cost effective. To make life easier, you can use our online form to book a collection and tell us what junk you’ve got for us to take away and when you want it done. Alternatively, call us on 020 8361 3801 (lines open 9am – 5pm, mon – fri). Other people tend to use your skip – not with us!